When mounting mirrors in a bathroom that includes a shower, it is important to remember, that if using adhesives, they must state that they can be used in a damp environment. I generally recommend the use of mirror clips or a frame of some sort in a damp environment. However, if installing a mirror wall to wall and counter top to ceiling, mirror clips may not be practical. 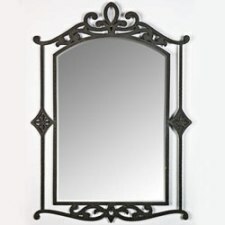 Custom mirrors that will mount from the top of a vanity to the ceiling and wall to wall are readily available. If you are a planning on installing this type of mirror yourself, triple check your measurements and the plumb of the walls and ceiling. Cut-outs to accommodate electrical outlets, switches and lighting junction boxes can be made at the same facility as where the mirror is ordered. 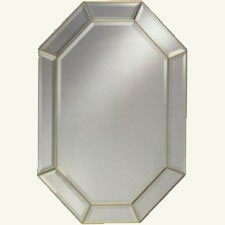 Again, check your measurements and provide the mirror manufacture with a drawing. If you have a cut-out for an electrical outlet or switch - the back of the cover plate for the outlet or switch will reflect off the mirror. 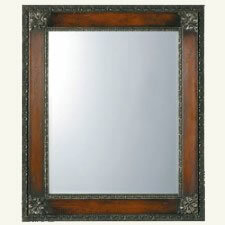 Remember that it is not the surface of the mirror that provides the reflection it is the silver finish on the back. Hence, anything placed against the front of the mirror's glass surface, such as a cover plate or light fixture will reflect off the silver surface and you will see the back of the item. 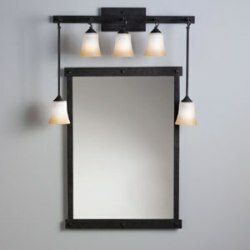 If an electrical outlet or switch can be conveniently mounted in positions that are not through the mirror you will save a substantial amount of money when you purchase the mirror by not having a cut-out. It should also be noted that mirrors have a tendency to develop crack lines from square cut-outs. When mounting an electrical outlet in a mirror DO NOT over tighten the screws that mount the outlet to the electrical box, as this will definitely produce a crack in the mirror.